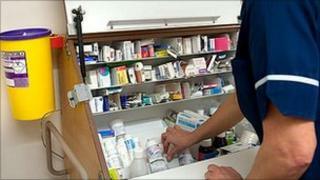 Better use of information technology in England's hospitals could help prevent 16,000 deaths a year, a report says. University Hospitals Birmingham has recommended its system to the team investigating above-average death rates from 2005 to 2008 at Stafford Hospital. The trust says it saw a 17% fall in deaths among emergency patients over 12 months, which would equate to 16,000 deaths prevented across England. Systems include a computer reminding staff to give patients their drugs. The trust says IT surveillance on its wards is backed up by a policy of holding staff to account for errors. The report shows how the trust has harnessed IT to bear down on errors, with the initial focus on preventing missed medications. Evidence suggests that hospitals may miss one dose in every five. Staff at the trust are issued with computer-generated reminders, and the system also issues warnings to prevent prescriptions which could harm the patient. The number of medication errors at the trust has halved, which has coincided with a sharp fall in deaths for patients admitted as an emergency, the report says. Missed medications are just one of many clinical activities that are monitored on University Hospitals Birmingham's computer database, and presented to staff on the wards on a dashboard display. It also includes falls, checks for blood-clots and infection control. The system also generates alarms when staff key-in clinical information that could give cause for concern, such as changes to a patient's temperature, heart rate, or blood pressure. This triggers an alert in the critical care Unit, prompting an outreach team to be dispatched to wherever they are needed in the hospital. Where mistakes arise, the real-time feedback to senior executives enables them to call staff to account, with regular reviews to assess and explain performance. The trust's medical director, Dr Dave Rosser, said nurses in modern healthcare have trained and worked in an environment where one in five drugs is not given and that this has become the norm. "It has become over the decades culturally acceptable for drugs not to be given to patients, and what we've been trying to do here is turn round that culture and say every single dose is important." Dr Rosser was asked to present a report to the public inquiry into the Mid Staffordshire NHS scandal. The paper shows that mortality rates for patients admitted as an emergency fell by nearly 17% over a 12-month period, but remained static in the rest of England. He said that if his trust's approach was adopted across the NHS, this would equate to 16,000 deaths avoided. The matron in the critical care unit at the Birmingham trust's Queen Elizabeth hospital, Helen Gyves, said nurses recognised the value of tight clinical scrutiny. "All of the ITU nurses work in a hi-tech environment so they are used to the impact of IT. So if you asked us why we hadn't done something or if you can give us evidence to prove that by challenging us things will improve for the patient, then we wouldn't mind." The matron in the hospital's clinical decision unit, Liz Miller, said increased accountability had improved the culture of care. "A good nurse ensures that all of the care is given to the patient. Not just the medication, not just the fluid, but also the personal hygiene, those nursing touches, the communication with the patients. How well she gives her medication and how on time she gives her medication is a good barometer of the all-round care that she gives." The system at University Hospitals Birmingham is one of several commercially available to the NHS. The chief executive of the Patients Association, Katherine Murphy, welcomed the work at the trust. "This system has the potential to really make a big difference to patient safety across the board. By highlighting ongoing problems and trends in patient care, ward and trust leaders can put changes in place to prevent other patients from suffering in the same way, learning from their mistakes rather than trying to bury them under bureaucracy." Health Minister Simon Burns said the system was "an excellent example of how the NHS can harness information to improve patient care". "Our ambition is to unleash a revolution of information throughout the NHS, so that everyone benefits from a modern, responsive service," he said.